Ben 10 The Mystery of Mayan Sword | Play Game Online & Free Download Here’s another new mysterious ben 10 game for the kids – Ben 10 The Mystery of The Mayan Sword. The Forever Knights in search of the Mayan Sword which is said to be the most powerful weapon ever made. Help Ben 10 secure the Mayan Sword before it goes into the evil hands of Forever Knight. Here’s another new mysterious ben 10 game for the kids – Ben 10 The Mystery of The Mayan Sword. The Forever Knights in search of the Mayan Sword which is said to be the most powerful weapon ever made. Help Ben 10 secure the Mayan Sword before it goes into the evil hands of Forever Knight. 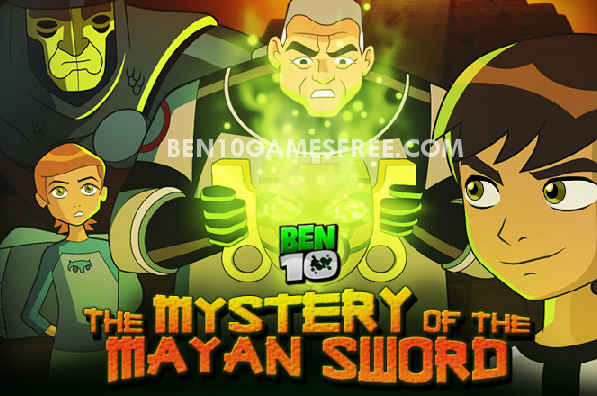 Based on the epic tale of the Mayan God of War, Ben 10 The Mystery of the Mayan Sword is an interesting game. A mysterious Mayan mask appears at a construction site and Grandpa Max senses the upcoming trouble. He asks Ben 10 to find a way to get hold of the Mayan Sword before Forever Knights get it, otherwise, the whole humanity may struggle for existence. Ben 10 Mystery of Mayan Sword game is a mission-based game where you have to find certain clues, solve puzzles and think ways to complete the mission. This game is very similar to another game called Ben 10 Alien Device. Unlike other ben 10 games, this game is played with mouse only. Investigate the scene around you, click objects to find out what they can do and find out how to achieve the target of the particular mission. Best thing about Ben 10 The Mystery of Mayan Sword game is that you can transform into different aliens as per the requirement of the mission. Just follow the arrow pattern in the Omnitrix correctly to transform into alien and get some extra points too! Pro TIp: Hover around the screen to find ‘Secret Area’ and earn more points. Apart from interacting with objects around, also collect the green colored gems to get more benefits in the mission. The key to winning this game is being observant and think what you can do using objects around you to achieve your goal. So that was all. Now it time to play Ben 10 The Mystery of The Mayan Sword game now! Help Ben 10 secure the Mayan Sword before it goes into the evil hands of Forever Knight. Good Luck! Don’t Forget to give your rating for Ben 10 The Mystery of The Mayan Sword game and share your tips and tricks to win this game in the comments section below.